kaze wave hair mousse is rated 3.7 out of 5 by 3. Hair mousse that defines natural curl and wave patterns with long-lasting flexible hold. Leaves hair with a soft, weightless finish and natural shine. Offers heat protection and humidity resistance. Safe on color-treated hair. Great for defined (yet soft) waves and curls, controlled braids and updos and frizz-free styles. with a dollop-sized amount of hair mousse in your palms, scrunch the product into your curls from just below the crown down to the ends. A natural gum made of hardened sap. Rich in calcium, magnesium and potassium. The ingredient adds moisture, natural-looking texture, and protects the hair fiber from heat styling and the elements. Aqua / Water ● Isobutane ● Myristic Acid ● Dimethicone ● Propylene Glycol ● Butane ● Propane ● Cetyl Alcohol ● Stearic Acid ● Peg-40 Hydrogenated Castor Oil ● Triethanolamine ● Phenoxyethanol ● Peg-11 Methyl Ether Dimethicone ● Palmitic Acid ● Acacia Senegal / Acacia Senegal Gum ● Parfum / Fragrance ● Laureth-4 ● Laureth-23 ● Glycerin ● Tocopheryl Acetate ● Ethylhexylglycerin ● Ppg-5-Buteth-5 ● Limonene ● Maris Aqua / Sea Water ● 2-Oleamido-1 ● 3-Octadecanediol ● Xylose ● Ethylhexyl Methoxycinnamate ● Alpha-Isomethyl Ionone ● Benzyl Benzoate ● Hydroxycitronellal ● Linalool ● Citral. For fine, floppy, curly hair that desires voluptuous defined curls, blending some fiber lift into the kaze wave boosts the hold and strength of the kaze wave to sustain those curls in suspension without becoming sticky. For centuries, Japanese painters have used the term haigo to describe the blending of pigments on a palette. 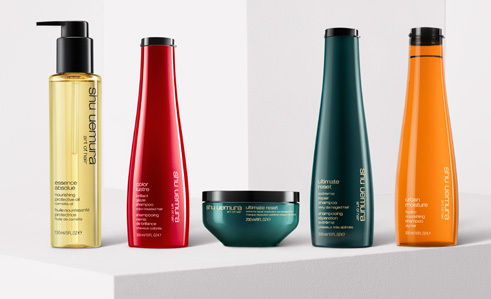 Here, layering & blending of shu uemura art of hair styling products create unique, personalized textures & results. Rated 5 out of 5 by Patty686 from What my hair has always needed! My hair stylist recommended this for my 3A curly hair. My hair is very fine and it seems every product weights down my hair and takes away my curls. Not this! This is a dream come true product! It defines my curls and gives my hair body! I can use a diffuser for "bigger" hair or let air dry and am never disappointed. I have had a life time of product disappointment until now! It's a bit pricey but so worth it!! Rated 1 out of 5 by sfmdca from Did nothing for my hair I have 3b curly hair, and this gave it no shape or control whatsoever. My hair was frizzy and the curls were not defined. Very disappointed, especially at the price! Rated 5 out of 5 by Anonymous from True Love Holy cow. I feel like I have found my one true love/ soul mate/ love of my life of hair products. I have always had really curly hair but I could never get it to do what I want, until now. This stuff holds curls and tames frizz at the same time without the whole Ramen Noodle Head look, meaning, crunchy, man-made-looking curls. My hair looks natural, soft, sleek, and minimal frizz (let's be honest, their is only so much an amateur hair stylist can do about that). I think this stuff cuts down on styling time too! The only con I can think of is that it is thickish but could be a good thing if you have thin hair. But even beside that, it is a small price to pay for how awesome this stuff works. Love, love, love.